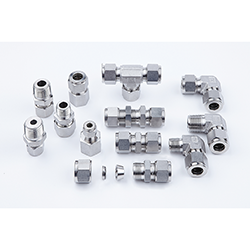 DK-LOK® Two Ferrule Tube Fittings are designed and manufactured to stringent dimensional tolerances in order to produce consistent leak tight performance as a pure assembly or when intermixed with Swagelok® in any combination. This excellence in leak tight performance has been proven via ASTM F-1387 testing as a pure DK-LOK® product and intermixed conditions with Swagelok® have been tested against ASTM F-1387 with 3rd party witnessing by TUV Rhineland. DK-LOK® provides leak-free sealing on high pressure gas, impulse, thermal shock, heavy vibration, and many other stringent applications which are all included in ASTM F-1387.